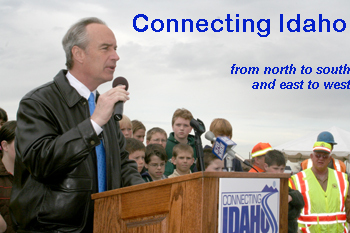 Governor Dirk Kempthorne signed legislation Friday that authorized the sale of $200 million in bonds as the first installment of the Connecting Idaho program. Approximately 175 community leaders, including legislators and city and county representatives, transportation officials, school children and citizens turned out for the ceremony near the Karcher Interchange construction project on Interstate 84 in Nampa. The Transporter will provide more coverage of the event – perhaps the governor's final public bill signing – next week. The Idaho Transportation board will begin its 2006 tour of districts next week with a two-day session in Lewiston. The board will visit two project sites near Winchester on U.S. 95: a Road Weather Information System (RWIS) site and proposed location for a new rest area. Members of Holy Trinity Episcopal Church in Grangeville take the concept “Cleanliness is Next to Godliness” as a fundamental principle, although you won’t find the oft-quoted phrase in the Bible. If it were a divine proclamation, the church members would be several steps closer to heaven because of their diligence in keeping a stretch of U.S. 95 free of roadside litter. ITD employees in Boise who want to formalize their efforts to lose weight and become more physically fit may have a new option. Donna Burns invites Headquarters employees to explore the possibility of forming a Weight Watchers group. Representatives of Weight Watchers will be on hand Monday (April 17). Idahy Federal Credit Union invites members to participate in its 54th annual meeting, April 27. The meeting will be in the Cascade Room at the Holiday Inn off Vista Avenue in Boise. The return of a half-hour “Family Fun Time” will precede the annual meeting from 6:30 p.m. to 7 p.m. The business meeting will follow at 7 p.m. and will include election of officers. Communities in Motion, a regional planning organization in southwestern Idaho, will accept comments on its Regional Long-Range Transportation Plan beginning Tuesday (April 18). The 30-day comment period closes at 5 p.m., Friday, May 19. A new public involvement opportunity for Communities in Motion – Communities in Conversation – will begin May 3 and continue through the end of the comment period.